The ‘56th Asia-Pacific Film Festival’ was held on December 15th in Macau, China, where South Korean movie ‘Snowpiercer’ (director: Bong Joon Ho) won the Best Production Design award. 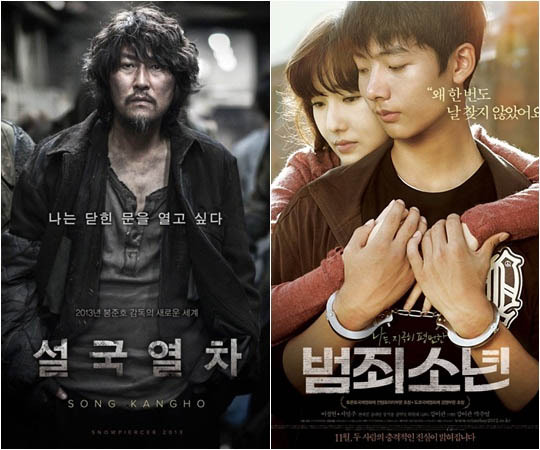 ‘Snowpiercer’ which is directed by Bong Joon Ho and has been watched by over 9 million viewers in South Korea, had been nominated in multiple awards categories including Best Director, Best Supporting Actor (Song Kang Ho), Best Supporting Actress (Tilda Swinton), Best Cinematography (Hong Kyung Pyo), Best Editing (Steve M. Choe, Kim Chang Ju), Best Sound Design (Choi Tae Young) and Best Production Design (Ondrej Nekvasil). Despite 7 nominations, it was only able to walk away with the Best Production Design Award on the night. Lee Jung Hyun and Seo Young Joo who were both in the running for Best Actor and Best Actress respectively for ‘Juvenile Offender’, also lost out in the end. The movie is about a teenage criminal (Seo Young Joo) who reunites with his mother (Lee Jung Hyun) who gave him up at birth. Taiwanese actor Lee Kang Sheng was named Best Actor for ‘Stray Dogs’, while Chinese actress Zhang Zi Yi won Best Actress for ‘The Grandmaster’. The Best Picture and Best Director Awards went to ‘Like Father, Like Son’ and its director Hirokazu Koreeda.